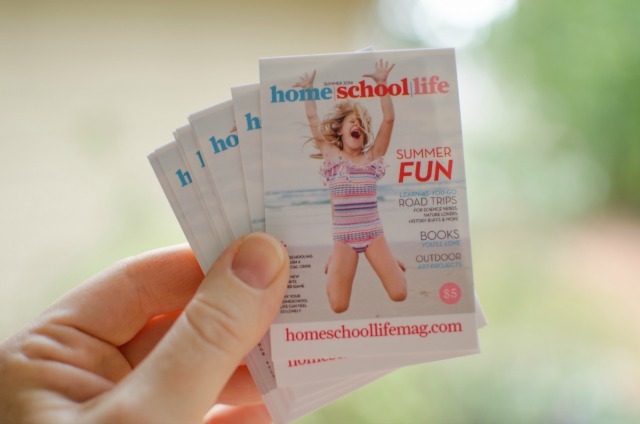 it’s a homeschooling magazine giveaway! I know that I keep bringing up home/school/life, the magazine I’m writing a column for, again and again. I’m just so impressed with what editor Amy Sharony is pulling together with a staff that could fit around a dining room table—and I mean one without the extra leaf installed. Her team is working hard to get this thing off the ground, to expand their readership, and I believe so much in the project that I’d like to help them. I would love for you to check out the magazine. I’ll make it easy, for ten of you at least. I have ten free downloads of the current issue. Leave a comment here in the next week, before midnight Pacific Time on Thursday, September 18. I’ll have a random number generator select ten comments, and I’ll pass along those free download codes. We may as well have some fun with those comments. In your comment, tell us a favorite bit of homeschooling or parenting advice. Just a quick line or two is fine. I don’t want to keep you from commenting because I’m asking for too much. Let’s pretend that we’re gathered around the dining room table, dishing. Comments are now closed, and winners will be contacted via email. If you’re just arriving here now, enjoy the fantastic advice offered in the comments! Be flexible and remember to enjoy the time you have together. Go with the flow, and a second, tomorrow is another day. Thanks for the chance. Enjoy your weekend. If it’s not working, don’t keep banging your head against the wall. Try something else, either a different approach or a different topic or decide how important it *really* is. Use the free resources in your community – parks, libraries, and people willing to share their passions with your child. Be present. Pay attention. Love them! Thanks for the opportunity to check out this magazine! When there are tears….back away and go do something fun. Nothing is worth that tension and struggle! I would love to have my hands on that magazine. Two down and two to go — I am curious what you wrote to your younger you. Oh, my advice — when the going gets tough, go to the park, or the zoo, or on a walk, just get out of the house and switch up the routine. I second ‘Pay attention’ – sometimes if you listen you can hear the giggles under the table in the next room or extraordinary kindness towards a sibling. Say yes whenever you can – great things come from unexpected directions 🙂 … also spent lots (as much as possible) time outside in all seasons because kids notice ths most amazing things . Read, read, read. You are in charge of the curriculum – the curriculum is not in charge of you. .. reading, reading, reading great books together on the couch with hot chocolate in the winter, watching the school bus drive by 😉 Oh, and changing things up on Fridays.. games day! Do and spend as little as possible in the early years. By “do” I think I mean plan, spend, schedule. Every homeschooler I know overschedules their first child’s first homeschool year to the point of insanity. We generally figure out that “stuff” is usually unnecessary by the third year. IF only we knew! When our children outgrew nap time, we transitioned right into “Quiet Time”. Our children are 17, 14, 12 and 10, and we still do this for one hour a day, Monday through Friday. We all (including mama!) spend our hour mostly reading or resting, sometimes writing. It’s a mini vacation in the middle of my day and then I am ready for the rest of the day. You know your child better than anyone – honor that. Do what feels right for you and your family, don’t compare yourself with other homeschool families. Make sure everyone gets plenty of fresh air, exercise/movement, and water! I’d love a chance to check this out. Thanks! Make time to hang out with other home schooling parents so you can get out of your smaller world and into a bigger one that supports your way of helping your kids learn. Notice the worry about doing too much or too little and let it pass. Everyone does homeschooling differently, and it’s okay. Choose your battles wisely and don’t sweat the small stuff. The ‘job’ of the child is to joyfully explore their world. One of my favorite pieces of advice is sleep when the baby sleeps. They grow so fast, just treasure the moments! We’re just starting out in the homeschooling journey (with a kindergartener and a toddler) but one of the things I try to keep in mind (especially when I get overwhelmed with all the choices and things we could/should be doing) is that important as the three R’s are, young childhood is about developing a life-long love and passion for learning and not as much about the actual academics. I just found your blog and the magazine today–would love to get my hands on a copy to see what it’s about! My kids teach me as much as I teach them. The most important lesson always is how to love by just listening. Don’t make your kids take music lessons if they don’t want to. Not everyone was meant to love making music…there are lots of other fun things to do and I’m sure you can find one that doesn’t involve making your kids do something YOU want more than they do. Dan said: “Kids learn best through play.” Marie said “…and go play with them! ” : ) Thank you and good luck to everyone.